Less than a month ago, the City of Edmonton introduced its new SmartTravel app to provide safety and traffic alerts to drivers, such as speed limit changes, approaching school zones, weather-related hazards and traffic disruptions. However, some app developers from Quebec are saying the app’s design is horrible and that the price the city paid for it was far too high, Global News reports. The creators of a new crowd sourcing photo radar app say theirs works better and they made it for less than $1,000. “First, the design is absolutely horrible,” Nagib Elmansouri said Wednesday. 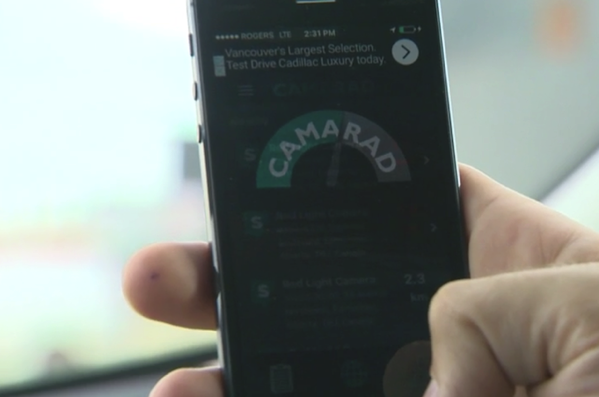 “I think the taxpayer got ripped off.” Elmansouri is speaking out about the city’s app because he and four friends came up with an app called Camarad, which is being launched in Alberta’s capital. Edmonton’s SmartTravel app cost $250,000 to develop and was paid for by revenues generated from traffic tickets. When asked if the Quebec-developed app does some of the same things, Gerry Shimko with the City of Edmonton’s Department of Traffic Safety said, “Small apples and big oranges maybe. It’s certainly a lot different.” He continued that even though the Quebec app is significantly cheaper, it isn’t nearly as sophisticated as the one being used in Edmonton. Shimko explained that Edmonton’s app not only warns drivers about road issues, but can also extract data from users to determine how effective the app is and where tweaks can be made. “What we’re trying to do is look at the messaging and verbal warnings and see if there’s a corresponding driver behavioral change”. Elmansouri however does not agree with Shimko, and said that the SmartTravel app is just another example of wasteful government spending, and that the same money could have been used for something else in the city.